Interstate 270 forms a complete beltway encircling Columbus, Ohio. 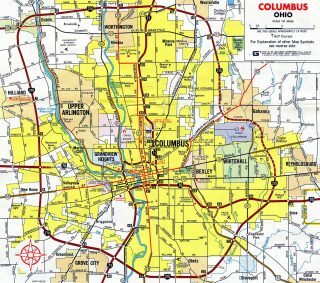 The circumferential highway serves an array of suburban cities, including Dublin, Grove City, Hilliard and Gahanna and John Glenn Columbus International Airport (CMH). I-270 provides a bypass for regional traffic along I-70 to Dayton and Wheeling, West Virginia and points north along Interstate 71. By 1972, only the stretch between Morse Road and U.S. 40 remained unopened along the Columbus Beltway. The portion between U.S. 62 near Gahanna and U.S. 40 west of Reynoldsburg was the last built in 1976. Work completed at the exchange between I-71 and I-270 replaced a loop ramp from the Beltway east to I-71 north with a new directional ramp and relocated the ramp to southbound. Just to the west along I-270 at U.S. 23, two loop ramps at the former full cloverleaf interchange were removed. Subsequent construction reconfigured the ramps with Ohio 315, added a single point urban interchange (SPUI) with Sawmill Road and converted the full cloverleaf at Cleveland Avenue into a six-ramp parclo. Interstate 270 heads northeast from the U.S. 33 freeway to a three-quarter cloverleaf interchange (Exit 43) with I-70. Photo taken 10/01/10. A lengthy c/d roadway extends north from the ramps with I-70 to U.S. 40 (Main Street). Photo taken 10/01/10. Interstate 70 westbound one mile outside of the Columbus Beltway at Exit 110 for Brice Road. Photo taken by Jeff Kitsko (07/10/99). A collector distributor roadway separates from Interstate 70 westbound for I-270 north to John Glenn Columbus International Airport (CMH) and Gahanna and I-270 south toward Obetz and Rickenbacker International Airport (LCK). Photo taken 10/15/04. Exit 10 partitions with the ramp for Interstate 270 north to Cleveland. 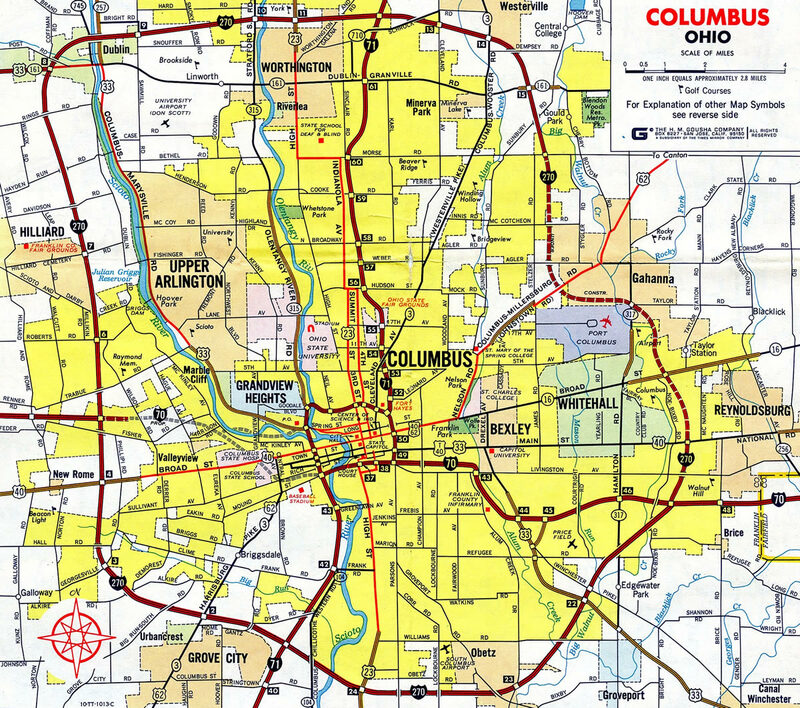 Outside local delivery, all hazardous cargo transportated through the Columbus area must use the beltway. Photo taken 10/15/04. Two miles north of the I-70 at Roberts Road (Exit 10) on Interstate 270 south. Photo taken 10/01/10. Exit 8 takes motorists bound for both directions of I-70 from Interstate 270 south at a directional cloverleaf interchange. Photo taken 10/01/10. Interstate 270 south provides a bypass for I-70 east toward Zanesville and Cambridge. The Colmbus beltway reconnects with I-70 near Reynoldsburg. Photo taken by Chris and Amber Lokken (06/23/08). Exit 91 departs I-70 east for Hilliard-Rome Road. Exits 93A-B follow with Interstate 270 (Columbus Beltway). Photo taken by Chris and Amber Lokken (06/23/08). A lane drop occurs along Interstate 70 eastbound for I-270 south to Grove City and north to toward Dublin and the northern suburbs of Columbus. Photo taken by Chris and Amber Lokken (06/23/08). I-270 south connects with Interstate 71 southwest to Cincinatti, U.S. 23 south to Chillicothe and Portsmouth and U.S. 35 southeast to Lancaster and Athens. Photo taken by Chris and Amber Lokken (06/23/08). Eastbound Interstate 70 reaches Exit 93A for I-270 east to Cincinnati, Zanesville and Wheeling, West Virginia. Photo taken by Chris and Amber Lokken (06/23/08). Exit 93B loops onto I-270 north toward Cleveland via Interstate 71. I-70 advances 2.8 miles east to split with Interstate 670 ahead of Downtown Columbus. Photo taken by Chris and Amber Lokken (06/23/08).